To start, tell me about the concept of the business. The idea is that the standard bra sizes that we have don't really work for a lot of people so what we're doing is, we're doing really good 3D custom measurements, and then we can turn that into a computer model and 3D print out a bra, basically. We're kind of hoping to fix the problem where there's these really discrete sizes that are in one-inch or two-inch differences and people don't quite fit that, so we're trying to fix it. How does this experience differ from someone going to the mall to buy a bra? In the mall they usually have the person who does the fitting and they've had five minutes of training and probably have worn a bra their whole lives, but there's not a lot more knowledge there than that. And they obviously do their best, but there's a much more limited selection -- again there's the discrete different sizes. This we can fit any different size. There are a lot of women who are uneven, even by one or two cup sizes, so we can accommodate that instead of them trying to find something in the middle that mostly fits. How do the bras themselves compare to something you'd get off the rack? Our goal is for them to feel the same. We don't want you to really notice a difference in the actual wearing experience. We still have straps and hooks and everything else that's normal, it just fits better. When I came in you were just wrapping up a consultation -- how does a consultation work? When you come in we get a bunch of information from you, like your name and your address and then we sit and talk about what it is that you want. The person who was just in here, she has a lot of opinions on where the seams in her bras are and she wants them for the support but she doesn't want them to show through her shirt. So we talked a lot about that. We talk about what fabric you want. We have a whole bunch of samples that you can go through and there's different feels and different colors. 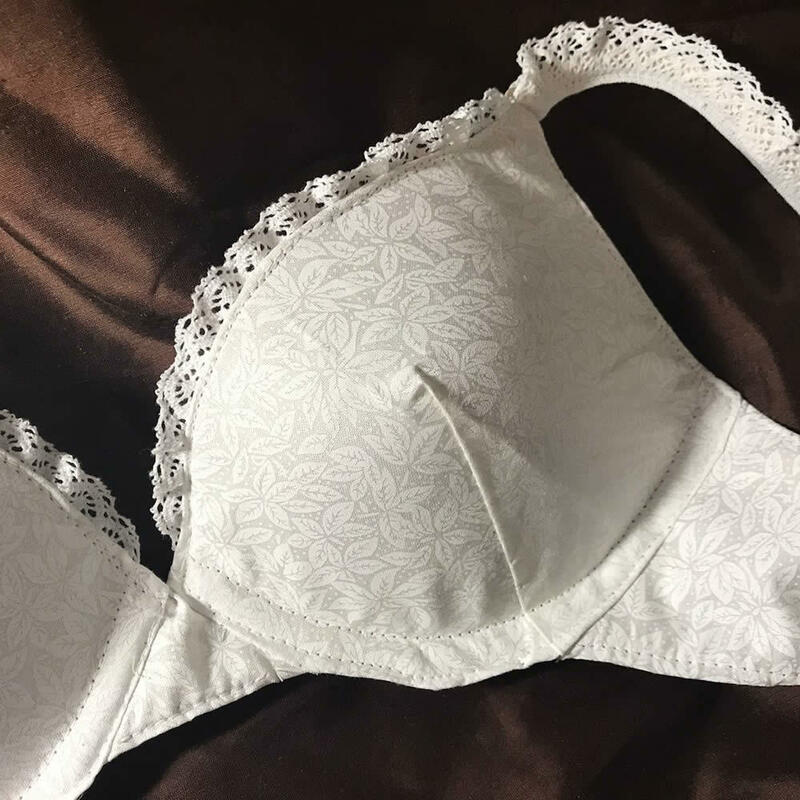 We can offer bras without underwire and with underwire, so we can talk about the pros and cons -- for a lot of people, an underwire is necessary, but for me, I like bras without underwire. Once we've sat and talked about what they want and I have a good idea about what I'm actually going to end up making, then we go and do a fitting. I have a fancy camera on my iPad, and a corresponding app, and what I do is literally walk in a circle around someone and the app takes pictures as I go around and builds a 3D model. [During this process, the person can disrobe to their level of comfort -- though the results will be best with no top or bra on]. And then I take that and do some magic to make it to go from there to an actual bra cup in my computer. As far as the manufacturing process, how does that work? The model that we get, we use that to make a second model of a bra. We kind of trim down bits to figure out what the shape of the bra is, like what the inside shape of the bra is. We're using a type of software called computer-aided design, which is typically used for 3D printing, and mostly you start from nothing and kind of build up. In this case we're starting from something and cutting down until we've basically cut your body into the shape of the bra that you want. And then we print out the foam cups and the underwire, and then I sew on fabric to make it look and feel like an actual bra. My partner, Ben, and I have been talking about a few different ideas. He's big into 3D imaging and 3D printing and he originally wanted me to come onto a microscopy project -- so, using a cell phone to take really high def, tiny photos. That one didn't really pan out, so we've been tossing new ideas back and forth and then I came up with this one, which we kind of needed a project that would make its own money, we wouldn't need to find an investor or bank. That was our challenge before. 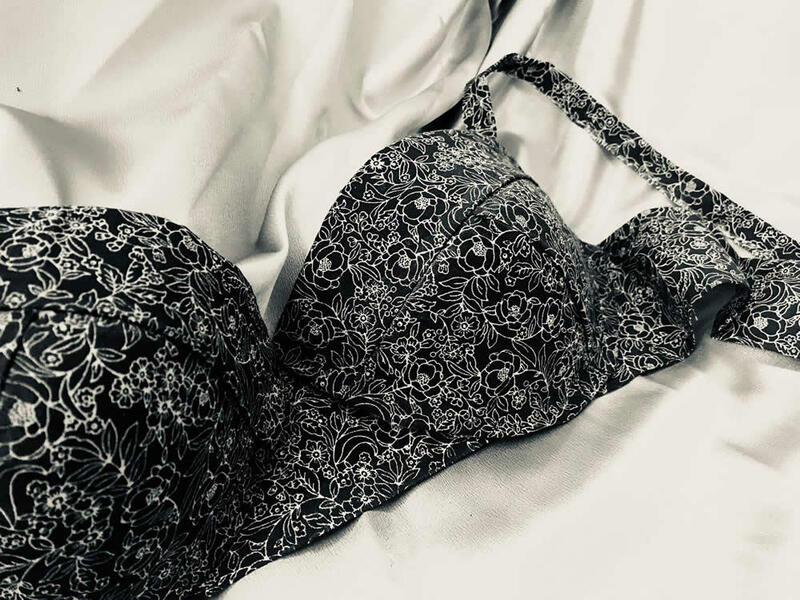 I've always had problems finding comfortable bras, I know a lot of other people in my life have had trouble finding bras period, so it seemed like somewhere we could fit in and serve a need that isn't currently being met. I know it's super early, but do you have any plans to add any additional products? Yeah. We're starting out with just a normal, everyday tee-shirt kind of bra and we can change shapes based on people's preferences, but we're starting with the bra you wear every day. And we also offer a sports bra. At some point what we'd like to add first is binders, which is used to compress everything. They're usually used for -- or at least the use I'm most familiar with -- is female-to-male transgender people use them to kind of squish everything down and appear more how they want to appear. So that's my next project. And then kind of the opposite. Foam cups that look like real breasts for people who don't have them. 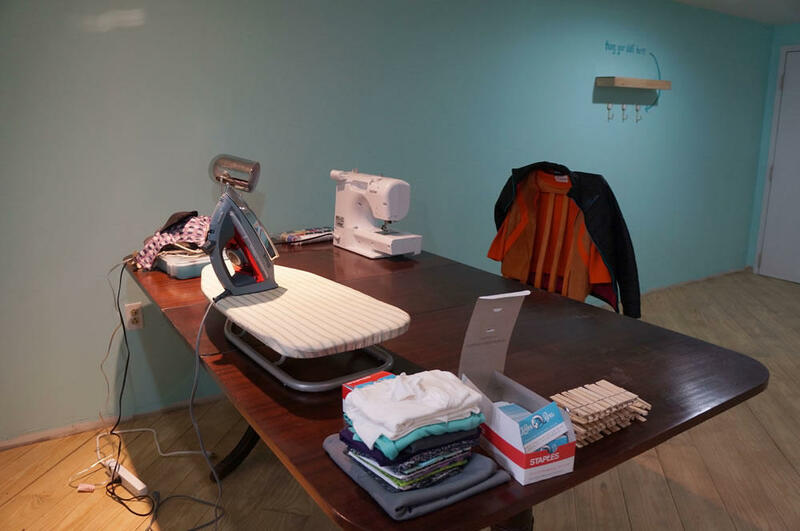 From there, we want to expand the business; make more storefronts available, do some pop-ups, because once we have a fitting we can just keep making bras for customers. But we need to do that initial fitting. And that initial fitting has to be in person, correct? Yeah. We'd like to be able to offer an app at some point. But the problem is that the way we're getting depth perception now is through a $300 add-on. We want to make a free app that uses the phone they already have. So that's going to be a challenge. Why did you decide to open in downtown Troy, rather than, say, the mall? It's partly just a financial thing. If we went out to the mall or went out to Saratoga, it would cost a lot more to get the same amount of space, probably half the space. So just thinking about money it wasn't a really practical idea. And the other thing is I've lived in Troy for six years and it's kind of blossomed a lot in that time and I wanted to be part of that. Zebra Bras is located at 48 4th Street in Troy. Hours are Thursday and Friday 12-6, Saturday 10-6, Sunday 12-4, and by appointment. Bras are $60-90. The business has a grand opening Friday, April 27 from 4-9 pm. Cristin Steding is a freelance writer and founder of Upstate Club, a guide to outdoor living in upstate New York. You can find her on Twitter and Instagram. "How do the bras themselves compare to something you'd get off the rack?" this is so awesome. i will totally be visiting. This is a brilliant idea and I am super excited to try them out! As someone whose size simply isn't sold in stores, I love this! Once I'm done with nursing bras, I'll be checking it out! I went in for my imaging over the weekend and I’m super excited to pick up my bras in a few weeks. The price point is exceptional. This is a CUSTOM bra. I pay far more than $75 for mass produced bras that are “close to perfect fit” and limited the colors and materials to what ever the company produces at the small/local lingerie store. I feel like Christmas is coming again! I am interested in setting up an appointment. I've spent SO much money on bras that aren't right. I like to support locale businesses!